Since this test there has been lots of talk of Valegro retiring from competition soon. Although as far as I am aware, nothing has been confirmed other than we can expect this to be his last Olympics! Many horses at this level would now be retiring to stud for a few years after this kind of performance with perhaps the odd ride. 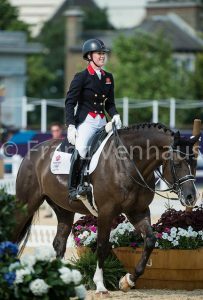 However, Valegro is a gelding and I can’t help thinking he would be a perfect candidate for cloning! One of my early blog posts explored the idea of designer horses and cloning (read here). But cloning Valegro would produce a stallion clone of Valegro! Don’t get me wrong, I know he was gelded for a reason. Whether it be for temperament or that he simply wasn’t considered good enough to be used as a breeding animal, However I think his performance has overcome these things! Although temperament has been proven to be heritable, there are so many other things which influence a horse’s temperament that I’m unsure if it would put me off using a certain stallion, especially if I had a mare with a good temperament! And I think 3 Olympic Gold medals proves that he has desirable qualities which would be well worth passing on to his offspring! I would therefore like to think that Carl Hester will consider the idea of cloning Valegro for this reason. Cloning is still very expensive, but I think that a Stallion Valegro would be very profitable! And I’m sure that there would be many people interested in investing in a Valegro Stallion! What are your opinions on cloning horses? Would you chose to breed from a Valegro clone? Would you want it to have some competition results of its own?